Kanye West is reportedly the victim of a Million dollar signature forgery scandal. According to TMZ reports, a source told the publication that a former friend and G.O.O.D. Music associate, Malik Yusef, secretly contacted designer Philipp Plein to arrange a Kanye West performance for the brand’s New York Fashion Week presentation happening on Monday. Yusef reportedly posed as West’s representative, negotiating a $900,000 deal to perform at Plein’s runway show. 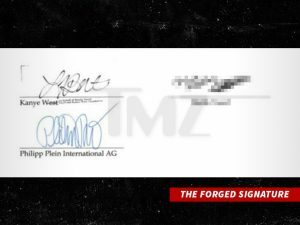 TMZ even obtained what appears to be a contract document showing a Kanye West signature, presumably forged by the individual in question. Plein apparently fell for it hook, line and sinker, and they made a deal wherein Kanye would supposedly pocket 7 figures and, in return, he would perform at the NYFW show. It gets worse, the guy forged Kanye’s name on the contract and then had a $900,000 advance wired to an account, which the guy promptly cleaned out. 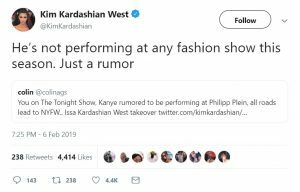 Amidst all this, rumours related to his appearance at Philipp Plien NYFW show were also put to sides by Kim Kardashian, who tweeted.